Lipitor is used with other medications to lower blood cholesterol levels. It can also be used to treat high lipid levels in patients. Lipitor is considered one of the statin drugs; this means it is a certain type of reductase inhibitor. Lipitor works by reducing the levels of bad cholesterol and triglyceride at the same time Lipitor increases the levels of good cholesterol in the blood. Lipitor can also be used to decrease the risk of stroke, heart attack, and other heart conditions in those with type 2 diabetes, coronary heart disease, or other risks. Lipitor side effects include fever, headache, stomach pain, weakness, constipation, diarrhea, indigestion, and nausea. Lipitor can be costly, but you can save up to 50 percent if you buy Lipitor from a Canadian pharmacy. Generic Lipitor (Atorvastatin ) is also available for extra savings. Copyright © 2019. QualityPrescriptionDrugs. All rights reserved. 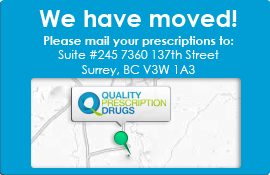 All trademarks and registered trademarks appearing on this website are the property of their respective owners and qualityprescriptiondrugs.com is not affiliated with them in any way.